Aldrich escaped…again. Tristan forgot…everything. And Luke, well, Luke was getting more than a little impatient. But those were the least of Kira’s concerns, because something else happened in England—something she was trying desperately to forget. A wedge of evil had lodged itself in her heart, a little black hole had nestled into her flames, and it wasn’t going away—not anytime soon…and maybe not ever. 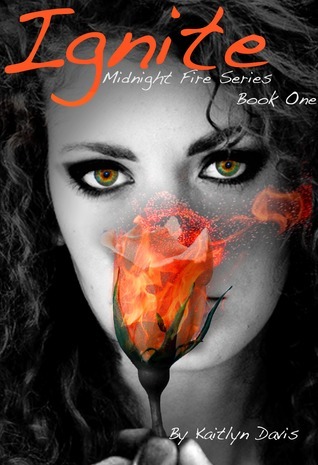 Scorch is the fourth and final book in the thrilling Midnight Fire Series. 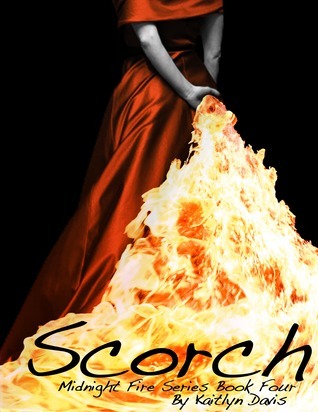 I’m Kaitlyn Davis, the author of the Midnight Fire Series—a whirlwind paranormal adventure with heart-pumping action and heart-stopping romance—and this blog tour is celebrating the release of Scorch, the final book in the series! Thank you for joining me! One of my favorite aspects of ending this series is that my main character, Kira, finally has to choose between the two leading men—Tristan and Luke! The suspense is killing some of my readers 🙂 And for a while, it was killing me too! So, instead of talking about Scorch, I thought I would take everyone back to the beginning—back to Ignite, the first book in my series (free wherever ebooks are sold!). Next up? Kira and Tristan’s impromptu acting scene! Kira knows Tristan is keeping secrets—heck, he kissed her and than ran away just so he wouldn’t have to tell her the truth. But this time, Kira has a plan. She sits next to him in class, completely ready to interrogate him, when their teacher assigns paired readings of Romeo & Juliet. Kira thinks it’s the perfect moment to find some answers, but Tristan has another idea in mind… Ignorance is bliss, right? He should have known. The second he walked into class, he should have noticed her suspicious absence from Luke’s side. But it wasn’t until Kira slipped silently into the seat next to his that it hit—she had duped him. And now they were a pair, reading some of the most romantic words in the English language. He never should have taken her to the church—really, he never should have kissed her. Even before that, he never should have stuck around to draw her. When he happened upon her at the park, he should have just stopped, turned around, and walked away. She made him feel so…alive. He couldn’t walk away. Not from that. There was nothing for them. Pain he was used to, but he wouldn’t force it on her. Next to him, Kira coughed. He turned to her, wincing as his heart started beating stronger, reminding him what he was determined to forget. “But soft what light through yonder window breaks,” he read, removing any and all emotion from his voice. Pretending—it had become second nature by that point. After a century of pretending, it should be easy. But stealing the love from his voice was hard, much harder than any role he’d played before. He forced himself forward, reading as quickly as he could, trying to end the torture. Did she have to remind him? Tristan thought, meeting her eyes for a split second, before dropping back to the page. It was too hard to look at her—those fire-filled eyes would burn his resolve away. “Oh, really? I hadn’t noticed.” He added a hard edge to his voice, doing his best the play the character he had created. Tristan deflated, defeated. Idiot, he thought. She placed his moleskin journal on the desk, twisting the knife. He looked away while she continued talking. Private, Tristan thought and looked up—straight into Diana’s watchful gaze. How could he have let this go on, they had drawn too much attention already. It wasn’t safe. Every second they spoke, the more in danger Kira became. He had to end this, for good. But he had to act natural, annoyed, so they would buy it. “Hey Juliet, it’s your turn,” he drawled, acting the jerk, trying to play it cool while his insides boiled. “Oh right,” Kira said. She looked down and started reading, copying his monotone style. A laugh slipped through his lips—lips caught in a half-smile. Why was she so damned amusing? He cursed. “I get it. I sounded like an idiot,” he said, trying to force her to stop. But Kira just continued. I have to stop this, he thought and took a deep breath. Leaning in closer, he whispered, “Okay, here’s the truth Kira. We can’t talk here and we shouldn’t even be talking now… or maybe ever.” He said, strengthening his conviction. She had to understand. “Yet you seem to have trouble understanding it. English is your first language, right?” He tried to joke, to lighten the mood. Kira just rolled her eyes, not easing the pressure. “I understand what you’re saying, but I also know you don’t mean it,” she said. A knowing smile danced on her lips. “I do,” Tristan said sternly, while his insides screamed that he didn’t. “Kira, forget that ever happened, okay?” At least one of us has to, he thought. “I should,” Tristan said, pushed to brink. He had to make her understand. She had given him no choice. The ice flooded back into his veins. The hunger swelled. He let it. Kira couldn’t look away. Even as panic settled in, she couldn’t break contact. In that moment, he knew he had her. She was trapped, a victim who didn’t realize she was the prey. He continued staring, let the fangs expand in his mouth. She had to understand—they would never work. As much as it would haunt him, as much as the memory of that kiss would burn—stronger than the sun itself—he had to scare her away. There were no choices left. He wasn’t strong enough to let her go. She had to fear him. It would be better this way, he told himself, even as the hurt settled in. After another moment, he released his supernatural hold over her. “Me,” he told her. Bitter. Me, he thought, letting the loathing surge. Kaitlyn Davis graduated Phi Beta Kappa from Johns Hopkins University with a B.A. in Writing Seminars. She’s been writing ever since she picked up her first crayon and is overjoyed to finally share her work with the world. She currently lives in New York City and dreams of having a cockapoo puppy of her own. Thank you so much for joining my blog tour!! These guest posts were so much fun to write — I hope your readers enjoy the feature!